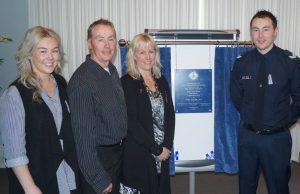 The Ararat Branch of the Victoria Police Blue Ribbon Foundation has been enormously active in their local community for more than 13 years and provided several significant health care projects in the Ararat Hospital. The Peri-operative Unit at Ararat Hospital was built in 2006 and new technology along with increasing demand created a need for its upgrade. The Blue Ribbon Foundation and the Ararat Branch jointly funded a significant portion of the Unit’s redevelopment through a donation of $100,000. These funds were used for the re-design and construction of the Theatre Recovery area and the Day Procedure area to improve work flow to cater for increasing numbers of day-stay patients. In short, the improvements have provided Ararat Hospital with greater capacity to perform both complex surgical procedures and day procedures for the public of Ararat and surrounding districts. Jason Bond was born and raised in Ararat and worked at several jobs after leaving school. He was a talented sportsman that enjoyed football, water skiing and motorbikes. He applied to join Victoria Police and was accepted into the Police Academy in 2011. After the end of his fourth week of training was returning home to Ararat he died from injuries received in a two car collision. He was given a Police Honours funeral, attended by hundreds including the Chief Commissioner of Police and his Academy squad mates who formed a guard of honour outside the church.